Trump Finally Pivots—but Will It Last? 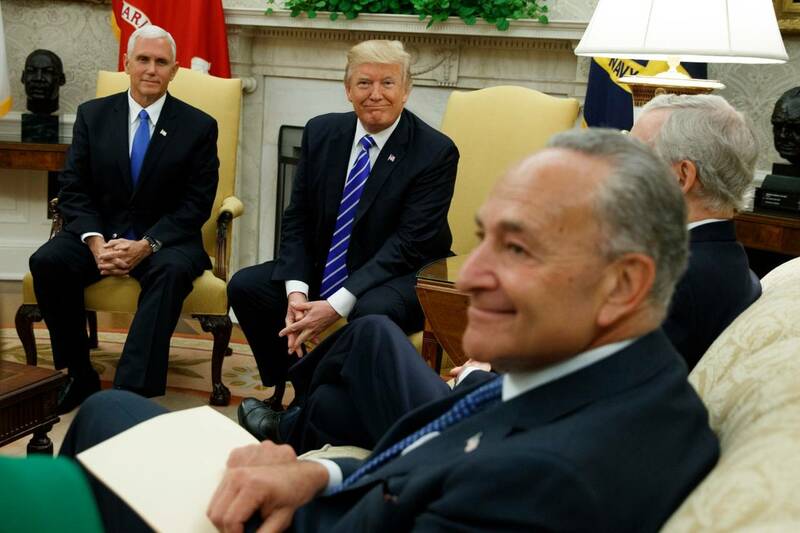 He had a great meeting with ‘Chuck’ and ‘Nancy.’ What comes next is anybody’s guess. I thought it would come sooner, on the heels of the inaugural address in which President Trump deliberately declared his distance from the Republicans of George W. Bush’s era and the Democrats of Barack Obama’s : “Washington flourished—but the people did not share in its wealth. Politicians prospered—but the jobs left, and the factories closed. The establishment protected itself, but not the citizens of our country.” That was the famous “American carnage” speech, and it was Mr. Trump saying he was something new, a beginner of things, a party of one. Because the pivot has come late, after almost eight months of fumbles and blunders that hardened sides, the outlook for any new and sustained legislative progress seems doubtful at best. But yes, what we saw this week was Mr. Trump’s pivot toward the Democrats. It’s amazing he didn’t try it sooner. Mr. Trump is not, as all know, a conservative; he has in his history of statements and positions been at least as much a Democrat as a Republican, and long contributed money to both parties. His core supporters have always been misunderstood as right-wing when they’re something broader and more complicated than that. Mr. Trump has never been a standard Republican. He beat all the standard Republicans in the primaries. On top of that, to govern successfully in an increasingly postpartisan nation, he always needed Democrats on the Hill more than he needed Republicans. He could always, for instance, get most Republicans to support some kind of tax reform, but he’d need Democrats to get a bill comfortably over the top and broadly accepted by the people. Mr. Trump instead threw in with Republican leaders, was disappointed on health care, and concluded they were useless. I suspect most voters will like the deal made this week—get something done, pass a bill! America doesn’t need a government shutdown or a prolonged debt-ceiling debate or a stupid argument over helping Houston (and soon Florida). North Korea is bubbling, hurricanes are battering—people won’t mind this deal, and a lot of them will actively approve of it. The president’s core supporters won’t hold it against him. Again, he had a lot of support from traditional Democrats. His core is not far right, it’s opposed to how Washington has comported itself the past few decades. They have a tropism toward the outsider, and the more the mainstream media hate him, the more they’ll stick with him. Will the pivot last? There are plenty of reasons to doubt it. Mr. Trump isn’t moving toward the Democrats from a position of strength. After the inauguration, he would have had the mystique and power of a new force who’d just won an amazing election. Now he’s battered. Mr. Trump has always put himself forward as the best deal-maker in history, and his core supporters have respected that—he’s “The Art of the Deal,” a survivor who finagled his way through bankruptcies; he’s shrewd. But he hasn’t demonstrated this in the presidency. Triangulating—making deals with the other party while holding on to your own—requires real policy depth. You have to know what’s nonnegotiable, what can be given up without much damage. It requires a kind of philosophical reach—knowing what you and your supporters stand for and why. Without that knowledge you’ll get outfoxed. Without it you’ll get rolled. As for the Democrats, their base has come to hate the president as never before. He’s done little to bring them over or blunt their antagonism. That base with its rising left will make Democrats on the Hill pay a heavy price for working with him. They’ll howl and call Democratic leaders sellouts, complicit, accuse them of doing deals with the devil. To get around this, Democratic leaders will have to press Mr. Trump hard to the left in the deals they make. That in turn would set Republican lawmakers on a path of true rebellion. The president gives the leadership no credit for it, but Republicans have been patient with him, squelching their criticism after embarrassing tweets and statements. They did so not only because they fear Mr. Trump’s core supporters, which they do, but because they hoped to make real progress with him, as they did early on, with Justice Neil Gorsuch’s appointment. But if a Trump being forced too far left frees them from the idea that they must work with him, some will turn on him, venting their long-tamped-down fury. This will further, and in a formal way, rupture the party. Finally, a Trump in close alliance with Democrats will be disorienting to his closest allies in the House, the conservative members of the Freedom Caucus. They broke with the president on health care, but they come from largely pro-Trump districts, they’ve defended him more vocally and enthusiastically than the GOP leadership has, and they have good relations with him. But they are traditionally conservative in their philosophy and stands. They would in many ways be philosophically opposed to the new Trump. For now the pivot is a major development. Democratic leaders in Congress are smiling and preparing wish lists. If the pivot lasts and works, it will be remembered as big. If not, it’s just another zany, fleeting, unconnected moment in Trumpland.